Chronic illnesses such as heart disease, arthritis and diabetes are now increasingly prevalent and chronic pain affects 1 in 5 adults in Australia. Research tells us that how well individuals cope and manage chronic illness now and in the future, is linked to an individual’s relationships health. In short, good relationships are good for you and bad relationships are bad for you. When someone is diagnosed with a chronic illness there is a tendency to focus on medical treatments, with the psychosocial aspects of the person often ignored. Hope re-visited – An interactive in-session guide for practitioners and clients to discuss reasonable hope in the face of chronic illness. Developed in partnership with expert psychologists and practitioners, the following resources have been designed to support practitioners in their work with clients living with chronic illness. Click the image to download. 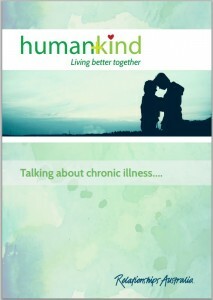 This booklet has been designed to assist practitioners to open up conversations about relationship health with clients and their loved ones. There are five questions specifically for people living with a chronic illness, and five questions for loved ones of someone living with a chronic illness. These questions are to be treated as a guide and can be adapted as required. Good communication is an important coping strategy when daily living is impacted by a chronic health condition. This set of three cards is designed to support people living with chronic illness strengthen their interpersonal communication. 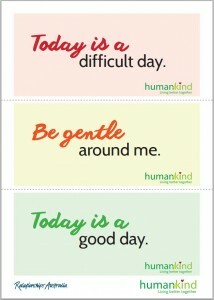 These cards can be printed, cut out and hung on a fridge with a magnet. In exploring the questions on the back of the cards, shared meaning and understanding of the three different states can be established and agreed upon. This is a personal discussion with no right or wrong answers. Highlight the importance of clear communication as a strategy for strengthening relationship health. It is recommended the therapeutic alliance is established before introducing the cards. All relationships go through difficult times. Normalising the experiences of your client is vital in seeking to alleviate stress. 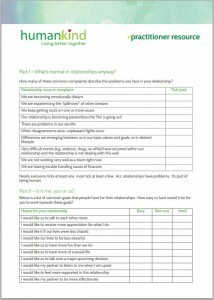 Adapted from the work of John Gottman, this resource supports practitioners to work with clients in identifying relationship issues and relationships hopes. Divided into three parts, your clients are asked to think about their most common complaints and what it is they would like more of in their relationship. It’s important to highlight that it may not be the chronic illness that is causing the stress and that relationship health can improve! Before using this resource, it is recommended that you view Hope revisited – An interactive in-session guide for practitioners and clients to discuss reasonable hope in the face of chronic illness, at the the top of this page.